Whether you are tech-savvy or just a newbie, you’ll definitely be glad to have a universal theme providing all the essentials in one pack. Well, it appears that such a solution has finally been released for WordPress users. 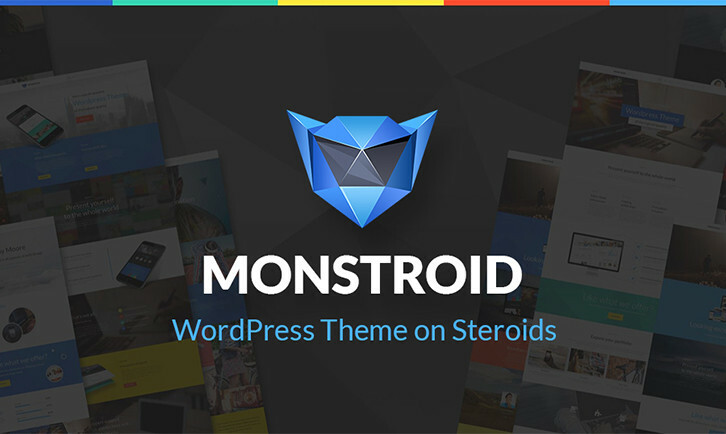 As its name suggests, “Monstroid” is a monstrously powerful WP theme suitable for any type of site, from blogs and news portals to personal & corporate portfolios and e-stores. It is equipped with a rich array of options for the design of your website. They include 145 predefined pages, 120+ PSD files, 50+ licensed images, 500+ fonts, multiple interface elements, styles, skins, child themes – you name it. This is just a modest beginning to the list of features, so read our review to learn about Monstroid in detail. 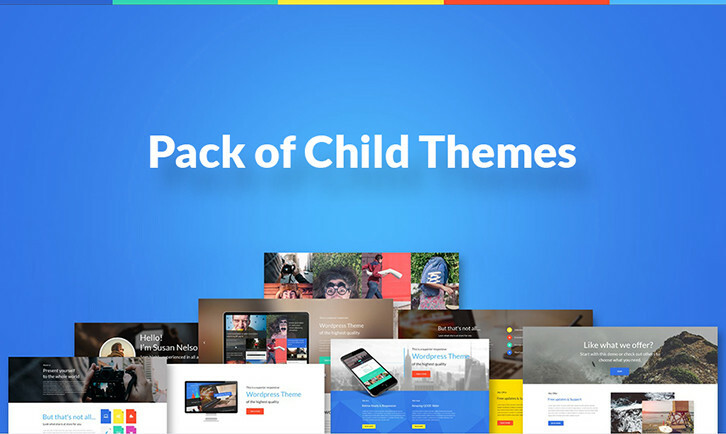 Monstroid does not only have unlimited design possibilities but also comes with 4 child themes. They embrace the topics enjoying the widest popularity in the web design community, particularly finance & IT for businessmen, art & photography for creative individuals and studios, education for instructors and schools, as well as interior & furniture for decorators and architects. What’s more, the scope of topics will be broadened eventually, and you will receive up to 15 child themes monthly. It means you pay for one theme, but obtain multiple themes for the same amount of money. As you can see, Monstroid allows you to save for a rainy day. First of all, let’s focus on the structure of pages. Monstroid enables you to create multiple layouts without touching the code. All you have to do is to enter the dashboard and manage the layout options right there. Depending on your preferences, you can build a boxed or full-width structure and make it of 1170px or 960px. To draw extra attention to specific info, you can also add sidebars to the right and left sides of the layout. Feel free to experiment with your website structure as you wish. Once you have settled on a layout structure, it’s time to proceed to styling it. There are 4 style options for arranging elements on the page, particularly grid, masonry, flat, and masonry flat. With their help, you can display your content in well-defined boxes or Pinterest-style tiles with or without gaps between them. To impart more diversity to the overall design of your site, you can choose different style options for different pages. Next, Monstroid is pre-built with a skin switcher, which is a tool allowing you to change the look of your site in an instant, i.e. with a single click to be exact. 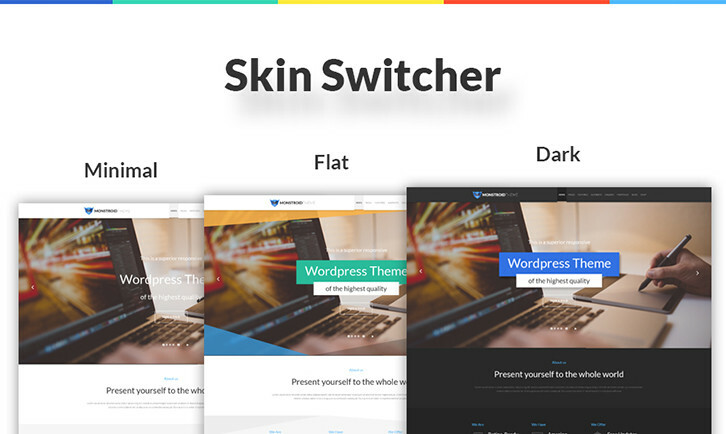 Initially the theme package contains 3 skins that reflect popular web design trends. Read about them below. Flat Skin lacks obtrusive styling details like ornaments or drop shadows, which provides a clear presentation of information and faster page loading. Minimal Skin utilizes ample, clean space ensuring perfect content readability and easy navigation throughout your site. Dark Skin makes effective use of black space adding a creative and sophisticated touch to your website aesthetics. Don’t overlook the fact that this number will grow later to embrace more options. Now, let’s dig deeper into the functional potential of Monstroid. Its major value is presented in a number of innovative features meant to facilitate your website building process. Take a closer look at each of them below. 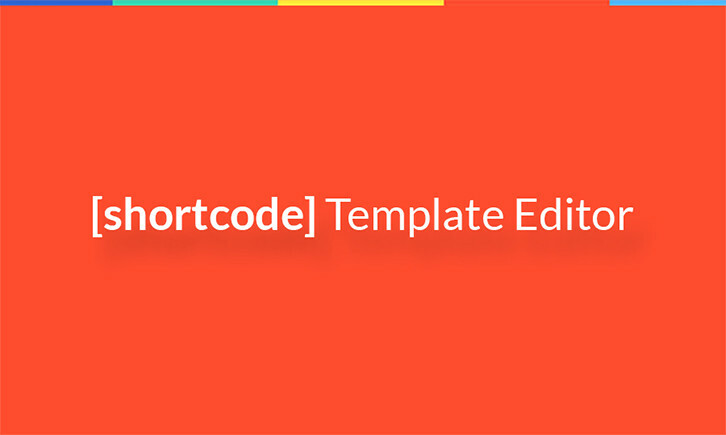 Shortcode Template Editor. Using this tool, you can build templates for shortcodes and edit them in many possible ways. Dynamic CSS. This feature is designed to bring dynamic changes to CSS. On saving the option settings, you generate a new file instead of rebuilding the main CSS file. 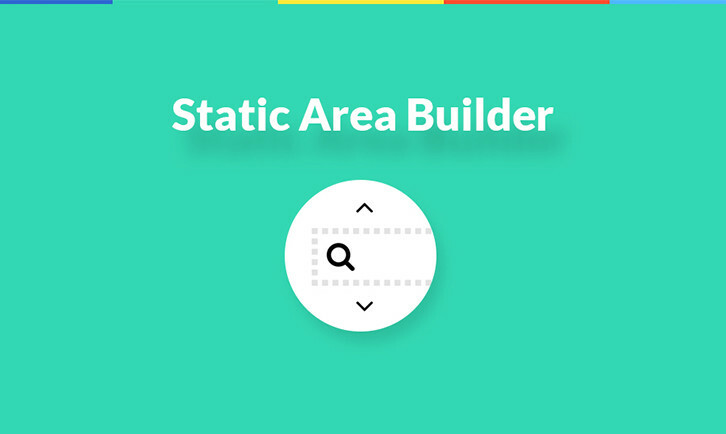 Static Area Builder. 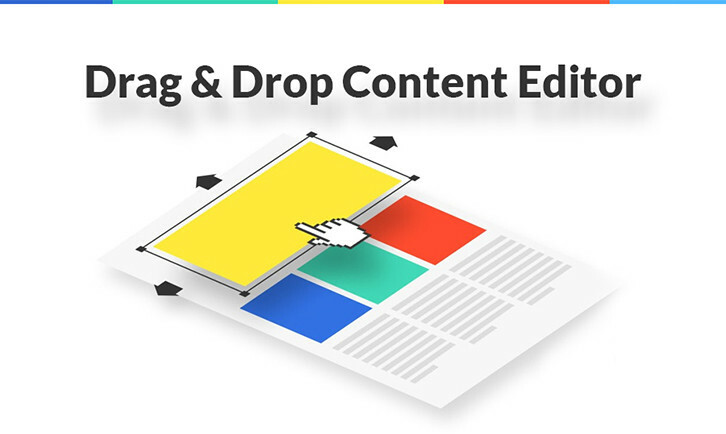 With its aid, you can locate header and footer elements (logo, banner, slider, navigation bar etc) wherever you like by dragging and dropping them. For example, you can attach a logo to any part of the footer. CSS Minifier. With this option activated, you can compile all the CSS files into a single one. Then, you can minify the size of that file to accelerate the speed of your website loading. Installation Wizard. It requires only a few clicks and takes a few minutes to install the theme and all of its components. Due to the wizard, there is no need to bother with FTP. The team behind Monstroid pursued a goal to deliver maximum ease-of-use to you while dealing with the website backend. If you are aiming to make profits online, you will find Monstroid useful for your undertaking. 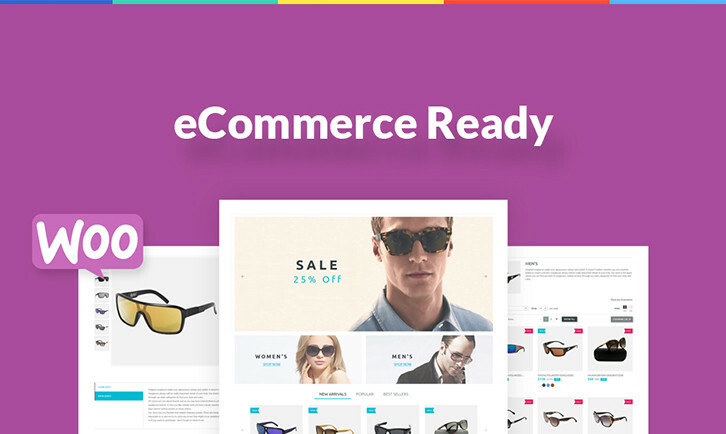 This is a fully functional WooCommerce theme equipped with a rich set of ready-made pages for a web store. Thus, the only thing you’ll need to do is replace the default content with your own, and that’s all. You can easily start selling your items from your inventory and monitor various details of your eCommerce activity. Keep in mind that child themes included in the Monstroid package are also WooCommerce-ready. Sometimes people are dissatisfied with the changes they make while customizing their website designs. Fortunately, Monstroid has an ideal solution to this problem. You can back up the theme and return to the previously saved or default version any time you need. It’s possible to back up both the content and settings in the admin panel. So, don’t be afraid to experiment with your website design, as you can always take a step back without losing anything important. Monstroid is supplied with multiple powerful plugins, which will let you build a functionally rich web resource. Each of those plugins can work as a standalone tool, but still you get all of them for the initial price of the theme only. Check some of Monstroid’s plugins in detail below. MotoPress Editor. This tool can help you customize the front end of your site by means of drag-and-drop functionality. Cherry Shortcodes. With this plugin you get 30+ shortcodes and 150+ of their variations. This allows you to add different types of content to your site and manage them with ease. Portfolio Page. 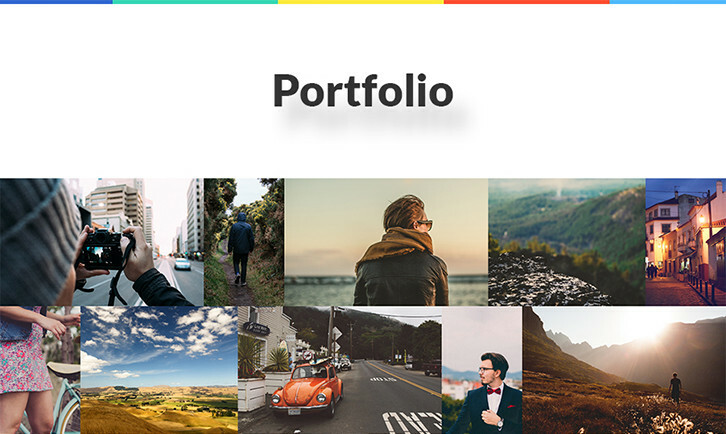 With its aid, you can embed a separate portfolio section in your site. It features a lot of functions and effects to provide a memorable presentation of your projects. Cherry Mega Menu. Improve your website navigation by equipping it with a mega menu. It can accommodate lists of links, buttons, text, banners and other elements on the dropdown panel. Cherry Charts. This tool is meant to build eye-catching infographics and diagrams that are ideal for illustrating statistics. Cherry Rank. This plugin enables website visitors to rate your product images with stars for greater credibility. Cherry Data Manager. It will come in handy for moving your website to a new hosting domain. Using the manager, you can both import and export the data with a single click. In addition to the rich set of plugins, Monstroid offers many other things that will be of great benefit for your web resource. Learn more about these helpful features that no successful site can do without nowadays. Compatibility with Popular Extensions. In this way, you can supply your site with many extra functions besides those built into Monstroid. For example, the theme supports bbPress to create a forum, WPML to localize your site, Yoast to optimize its indexation by search engines, and many more. 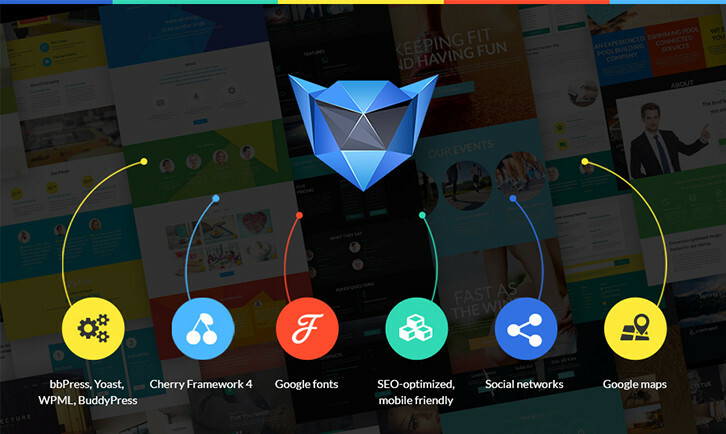 Cherry Framework 4.0. Monstroid is built with the Cherry framework, a Bootstrap-based WordPress theme framework that allows the building of websites with ease and speed. It has an independent modular structure, which means you can use its components independently. Today, the majority of frameworks are overloaded with unnecessary options that often annoy users, but the latest version of the Cherry Framework is different. 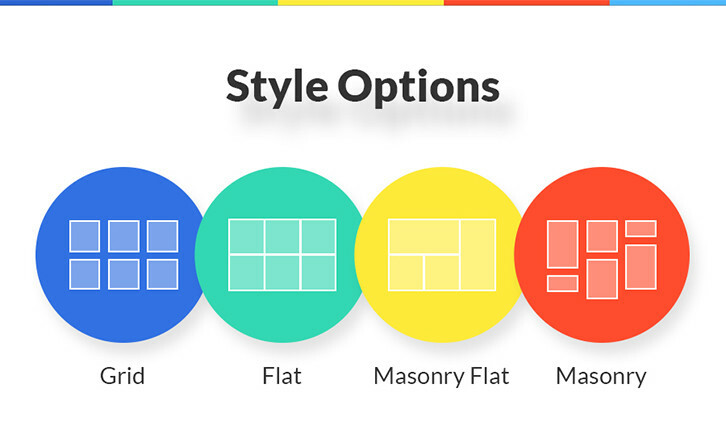 Using this tool, you can switch off all the options you don’t need while building your site. It’s really easy to master the framework. 500+ Google Fonts. With such a diverse number of fonts, you can bring any desirable changes to your website typography and make your content more readable. SEO & Mobile Friendly. These qualities are solid prerequisites for extending your website reach. People will be able to use your site on the go via portable devices, and search engines will rank it higher on the results page. Social Media Integration. It ensures your business promotion on Facebook, Twitter, Google+ and other popular networks. To be more accurate, you can let people register on your site and consequently sign in to it using their social accounts. They will also be able to subscribe to your official social profiles as well as comment, rate, and share your content with friends. Google Maps. Integration of this service allows customers to find your company’s location on an interactive map. Such a rich functional potential of Monstroid can add enormous power and flexibility to your site, but that’s not all. The team behind Monstroid took all the users’ needs into account, and included cool extras to the theme package. Together with Monstroid, you will also get the following things at no charge. 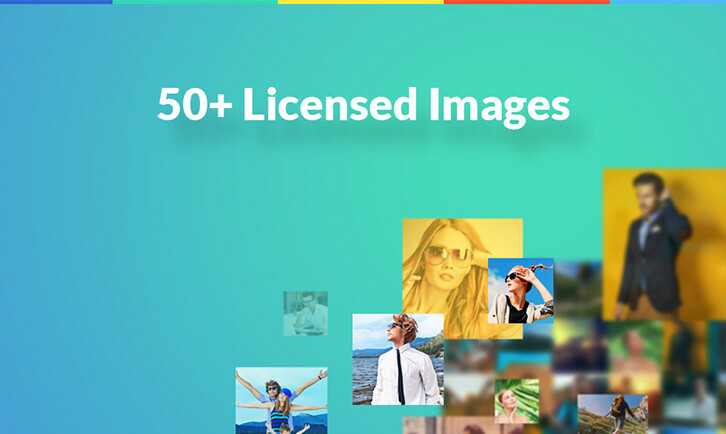 50+ Licensed Images. Monstroid comes with a pack of professional images depicting various topics, which means you will definitely find something cool for your site. It will let you save both time and money on the visual presentation of content. Documentation for End Users. The theme is packed with detailed instructions to guide you through installation, customization and other procedures. Video Tutorials. In case you do not understand something written in the documentation, you can watch video tutorials to see the way it works visually. Free Customer Support. If you become a Monstroid user, you will never be on your own with your theme. 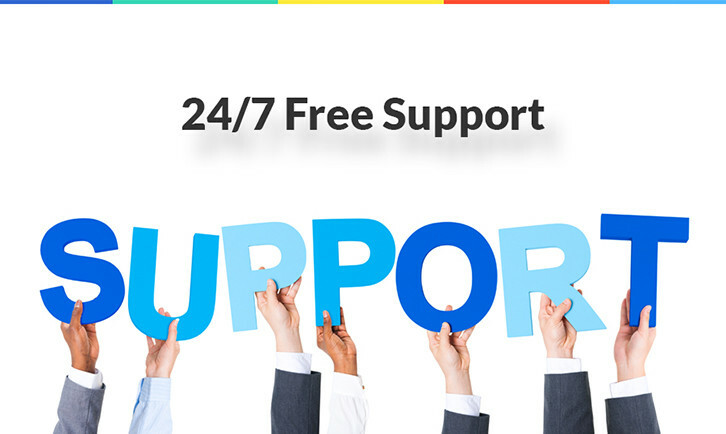 Just contact the support team to get an immediate response via a live chat 24/7. You can also send an email if you have no time for chatting, and the Support Team will contact you shortly. This free service is granted for as long as you use the theme. Lifetime Updates. You will receive a message about the availability of updates on a regular basis and optionally implement them on your site. The updates include new topics, features and bug fixes. As you can see, Monstroid is an all-in-one WordPress theme to minimize your efforts in building a site and designing its interface. You can be either a developer or an end user, it doesn’t matter at all. The theme is easy for anyone to use regardless of his or her skills and experience, and the opportunity to build any type of website, e.g. blog, portfolio or e-store, makes it even more attractive. So, give Monstroid a try and enjoy maximum ease-of-use in web development.